I’ve got a question for the purported defenders of pedestrian safety who sit on the editorial boards at the Daily News and the Post. I know they haven’t shown much interest in preventing the 10,000+ injuries and 150+ fatalities that motorists inflict on pedestrians in New York City each year, but the new Hunter College study on pedestrian injuries caused by cyclists has apparently piqued their interest in street safety. It seems we can all agree that the streets should be safer for walking. So, here’s my question: Aren’t they at all curious why, statewide, the number of pedestrian injuries involving cyclists went from 1,097 in 2007 to 927 in 2010? That’s a 15 percent drop in three years! Shouldn’t we try to find out why this is happening and apply those lessons to keep driving this number down? The Post and the Daily News seem to think they already have the answers. Both editorialized that the introduction of a public bike system next year and the accompanying rise in cyclists is going to increase the risk of injury to pedestrians. This is bizarre, because the data in the Hunter College report suggest that as more New Yorkers ride bikes, the number of pedestrian injuries caused by cyclists has declined. And, more broadly speaking, evidence from all over the world has consistently shown that places with high rates of cycling are also the safest for pedestrians. As Noah wrote on Monday, a recent analysis of 24 California cities and towns by civil engineering professors Norman Garrick and Wesley Marshall found that places with higher cycling rates tend to have lower rates of fatal and severe traffic injuries. Well, how about Tokyo? A frenetic global metropolis with more than 13 million residents. With all those people rushing to get where they need to go, Tokyo still boasts a pedestrian fatality rate nearly half that of New York. And check this out: In Tokyo, 16 percent of all trips include cycling. That’s an order of magnitude higher than the current cycling rate in NYC. The developed countries at the top of the list for bicycle mode share are the Netherlands (27 percent of trips), Denmark (17 percent), Japan (14 percent), Sweden (12.6 percent), and Germany (10 percent). The annual traffic fatality rate in these countries ranges from less than three per 100,000 people in Sweden, to 7.4 per 100,000 people in Denmark. In the U.S., with our approximate 1 percent bicycle mode-share, the carnage on the roads is much greater: 12.3 traffic deaths per 100,000 people, which works out to between 35,000 and 40,000 lives lost annually. Tens of thousands of lives would be saved each year if we could catch up to the world leaders in street safety. The top cycling countries have also attracted international attention for achieving dramatic reductions in pedestrian fatalities. Sweden, with its Vision Zero initiative, cut pedestrian deaths in half in five years. Germany and the Netherlands are also leaving the United States behind when it comes to street safety. Between 1975 and 2001, American pedestrian deaths declined 27 percent while Dutch pedestrian deaths fell 73 percent and German pedestrian deaths fell 82 percent, according to a 2003 paper in the American Journal of Public Health by Rutgers professor John Pucher [PDF]. One emphasis of Dutch and German policy has been to improve the transportation infrastructure used by pedestrians and bicyclists. For pedestrians, that has included extensive auto-free zones that cover much of the city center; wide, well-lit sidewalks on both sides of every street; pedestrian refuge islands for crossing wide streets; clearly-marked zebra crosswalks, often raised and with special lighting for visibility; and pedestrian-activated crossing signals, both at intersections and mid-block crosswalks. Dutch and German cities have also invested heavily to expand and improve bicycling facilities. From 1978 to 1996, the Dutch more than doubled the extent of their already massive network of bike paths and lanes (from 9,282 km to 18,948 km). From 1976 to 1995, the Germans almost tripled the extent of their bikeway network (from 12,911 km to 31,236 km). More car-free zones, pedestrian refuges, clearly marked crosswalks, and extensive, high-quality bike networks. Hmmm… Seen any changes like that around NYC recently? Imagine how much more progress we could make if our daily papers actually cared about street safety. actually, the Cyclists Union researched the length of the Dutch bicycle network and discovered that the Netherlands have 29.000 km of separated bike paths & 7000 km of on-road bike lanes. Even they were surprised it was that much more. The EPA values human life at about 7.9 million dollars when it calculates costs vs. benefits. So if 37,500 people are killed in traffic, that equates to almost 300 BILLION dollars. Per year. One would think that we could invest a reasonable fraction of that, per year, in transportation safety improvements. Which would translate into more traffic calming, better infrastructure for people to walk and bike, and better education for everyone. @84b4c887c2b7760497a9698785bbfb24:disqus But aren’t accidents the result of feuds among Greek gods? I mean, nothing can stop accidents from happening, right? Certainly not infrastructure investment. That’s why news reports blame the cars (“Van Kills Four”)–they’re the avatars of the gods. And I’m with @6b6a3fe730de2006198ee2f388021f7b:disqus: the scale should be the same on both graphs. Kinda misleading as it is now. The bars are scaled the way they are so that U.S. traffic deaths are the visual constant. 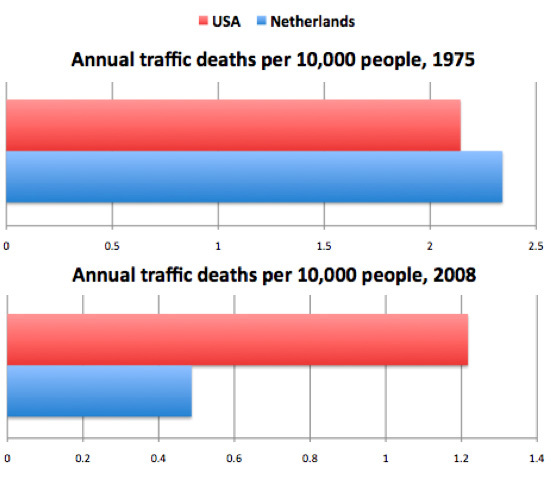 The point is to show the improvement in Dutch street safety relative to U.S. street safety. Agree with the intent of the article 100% but the figures show that annual traffic deaths have decreased in the US and it most certainly isn’t because we have put in infrastructure that is safe for pedestrians and bicyclists. This figure must include vehicle drivers and occupants so I would guess things like seat belt laws, and other vehicle-based safety infrastructure have contributed to the decrease seen in the chart. Of course, if we want that number to go down further, we have to build complete streets. Not sure about the logical thread in the post above. There are many, many factors other than bike usage that might influence road fatalities nationwide. Not suggesting that there *isn’t* some connection between low fatality rates and bicycle use, but it’s not entirely apparent why the Dutch approach is identified as so revolutionary when our urban capitals pretty much net out at the same fatality rate. Clearly, there’s some nasty danger on roads outside of NYC, but the post above seems to specifically not be talking about highway accidents in rural Nebraska. So, again, I’m not trying to make a scientific conclusion, but I’d suggest that based on the similar performance of NYC, Copenhagen and Amsterdam, this post isn’t in a position to make a real conclusion either. I suspect the nature of bicycling in Tokyo is somewhat different than it might be in many other cities mentioned. There seems to be almost no real “bike commuting” in the same sense you see it in NYC, etc — bicycles are almost exclusively a “local” transit mode; if you want to go any distance, you ride to the station and take the train. As a result, there’s a lot of very good bicycle parking infrastructure,† but there’s pretty much zero bike infrastructure on the road (bike lanes etc). People ride on the sidewalk, or in the same lanes with cars. Because streets are often narrow, and people ride slowly (local trips don’t need such great speed), that probably helps keep the accident rate down (though the sheer quantity of bicycle riders in some places probably make the absolute numbers somewhat high). It would be nice if they had some longer-distance bicycle infrastructure too! † Major suburban stations often have multiple massive bike parking facilities, with many many thousands of spaces (and usually no car parking at all — it simply takes too much space to be practical), and major shops and apartment buildings almost always provide ample bicycle parking. There’s a huge amount of practical pressure from bicycle riders, who will just make ad-hoc bicycle parking areas if formal facilities aren’t good enough (or they’re too inconvenient…). — The pedestrian fatality rates in Copenhagen and Amsterdam are absolutely consistent with the correlation between pedestrian safety and high cycling rates. The data is not ambiguous. You cited the overall traffic fatality rates in each city, which include much higher percentages of cycling fatalities than in NYC. Look at the pedestrian fatality rate in Copenhagen [PDF] — it is half that of NYC. In Amsterdam, the pedestrian death rate has fallen to about a third of the rate in NYC [PDF]. If NYC had a pedestrian death rate equivalent to those two cities, about 75 to 100 fewer people would be killed while walking each year. The opinion writers who want to halt progress on bicycle policy in the name of pedestrian safety are frauds. I think part of the general trend of increased pedestrian safety (not just safety as it relates to bicycle collisions) is probably an effect that is not due to increased bicycling, but simply because pedestrian and bicycle safety improvements usually go hand in hand. We’ve been seeing much more of a focus on traffic engineering for everyone’s benefit, and this just happens to include bicycle infrastructure. Giving bicycles a safe means of using the road definitely plays a role, but I don’t think it’s fair to say increased bicycling is the main reason for the improvement. I support increased bicycling safety and access regardless, but I think there’s more to it. @BenFried:disqus I get what you’re saying, but the data you’re talking through in the post is a confusing mix of pedestrian and overall traffic deaths, as well as a sort of unclear melding of municipal and national data. The chart at the lede represents trends in national overall traffic fatalities, but below, you’re talking about municipal pedestrian fatalities. Alls I’m saying is that there’s solid third-party science referenced in the post, but it doesn’t logically get us to your conclusions. I think I’m totally in agreement with @google-6bd4d5085f3de5f0622280ad4b5e50c2:disqus below. great research and a needed, documented response to a very limited Hunter study. Unfortunately the upstate papers pick up the already limited news item in the Post, and publish a one paragraph “conclusion” that’s simply anti-bike. A not of cation however the in-pavement lighting and some of the raised crosswalk surfaces mentioned near the end of the blog frequently don’t survive frequent snow plowing. In the first 28 days of the year, 191 cyclists were reported injured, up from 158, or 20 percent, from the same period last year. New York Post Bike Bile: Deliberate Lies or Pure Ineptitude?